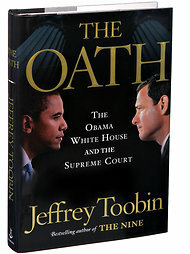 Jeffrey Toobin has impressed me on tv and with a few of his books. After reading "The Oath,"I am reflecting on some of the points brought up as well as my reactions to recent news on The Supreme Court. There is a great deal of contention over the role of the Supreme Court whether it is really political or making technical legal decisions in a neutral manner. We would all respect it more, even when we disagree if we felt they were making difficult decisions using only logic. There are a lot of hard feelings to contend with and to me it seems obvious that often political factors play a deciding role. People are elected for all sorts of reasons, but a driving force are these hard feelings. Such ideas as we deserve protection, life is sacred, we deserve freedom. Most people would agree in part with the three sentiments, but can get very concerned over the details. To assure their details are given attention it makes sense to organize around implementing them. The vast majority of us find our time taken up with survival and the pursuit of happiness. We tend to let others make many decisions for us assuming that our wishes will be respected. Leaving decisions to others always means that people with different motivations can force their concerns by focusing organizing efforts. I have written ad nauseum elsewhere about defects of the electoral system and short-sightedness of politicians. There seem to be just a few schools of thought. One is that free markets are the basis for decisions. Another school feels corporations have too much power. Another school is concerned about human rights. Still another is concerned about fundamentalist beliefs that need to be forced on the rest of the population. A bit oversimplified, but there are large segments of the population that stress the importance of one or more of these schools. The American electoral system requires money, lots of it. It is difficult to raise funds without obligations. Organizing voters is tricky as there are many issues. Many people boil their decision down to just one or two key issues. Aggregating issues is a delicate art form. The Republicans have found that wealthy people can supply the necessary funds, but most people realize their agenda is not favorable to the little guy. However many voters are more focused on social issues such as abortion, gay rights, immigrants and find themselves voting against their own economic best interests. One particular party was very critical of activist judges, but in retrospect it seems they meant they didn't have enough activist judges of their own. If there were any doubts after the Gore vs Bush travesty there should be none left now. The Supreme Court is only nine individuals who are selected through a political process. They are appointed for life by whichever party is in power at the time of a vacancy. The selection process has its own set of obstacles and the people selected are chosen not so much for their qualifications, but for their perceived ability to get through all the hoops. The candidates have their own campaign and need to be careful not to offend. A decision by the current Supreme Court in effect gave corporations the status of people at least as far as free speech in elections. In a few senses this is incredibly ridiculous, but more importantly it is undemocratic. Everyone's opinion should count equally or least have an equal opportunity to express it, but in reality money distorts that concept. As corporations are really just an aggregation of people and capital they have a lot of power. An individual can go outside and yell whatever strikes them worth the effort or to quietly try to persuade neighbors, acquaintances. Theoretically with talent an individual might create a bigger personal audience, but to get a very big audience costs money and in one sense it is relative. A minute on tv can be bid for, including the more desirable minutes and the more desirable audiences. The inter-net has a leveling effect. With talent and skill anyone's words can be read by millions although they may not possess wealth. Corporations are trying to figure out how they can more effectively harness this new platform. What is fair for one side, might be considered fair for the other, but the real concern is what is best for the people. It would be acceptable if at least the decisions made were favored by the voters, but that is not always the case. It is doubtful that many voters actually consider corporations as persons entitled to pay for election campaigns. Western legal systems are considered one of the reasons our civilization is superior. In truth every one benefits when there is true justice. Unfortunately money tends to the will of those who have the most. Although an American President is forced to retire after a maximum of eight years they can appoint a Superior Court judge for life that can have more effect on the citizen. In effect electing a president (and the Senate that confirms judges) has an even longer impact than most voters assume. If everyone got along and was content with how life was treating them there would be no need to make laws. Unfortunately people at all points of the spectrum are taken advantage of and it might be said we need protection from ourselves. The principle of appointment for life is supposed to protect the judiciary from political pressure, but it also locks in one set of perceptions. Perhaps a compromise might be a reasonably lengthy appointed time such as 10 years. It would be hoped that whatever time might be agreed upon it could be staggered so that the people do not have a drastic change in a short period of time. I have been in many informal talks about politics and justice and we often joke at the end, "now that we have solved the world's problems." Of course no one in power is even aware of our efforts, but it is still in our best interest that many people have these conversations so we can think out the serious issues and make an intelligent decision at that time that really counts or even better enter the discussion at a more thoughtful public level. Your thoughts are welcome. Labels: activist judges, appointments for life, corporations are people, hard feelings, Jeffrey Toobin, politics, protection, solving the world's problems.